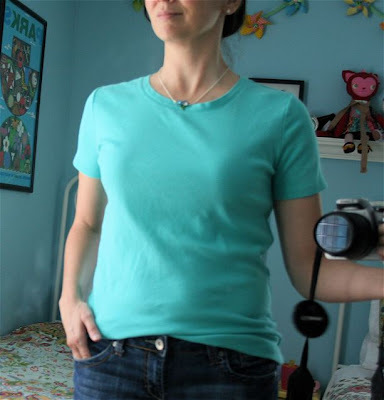 Today's featured guest is Larissa from mmmcrafts. Hers was one of the first blogs I found when I was introduced to craft blogging, and it was love at first site. I know you'll agree. 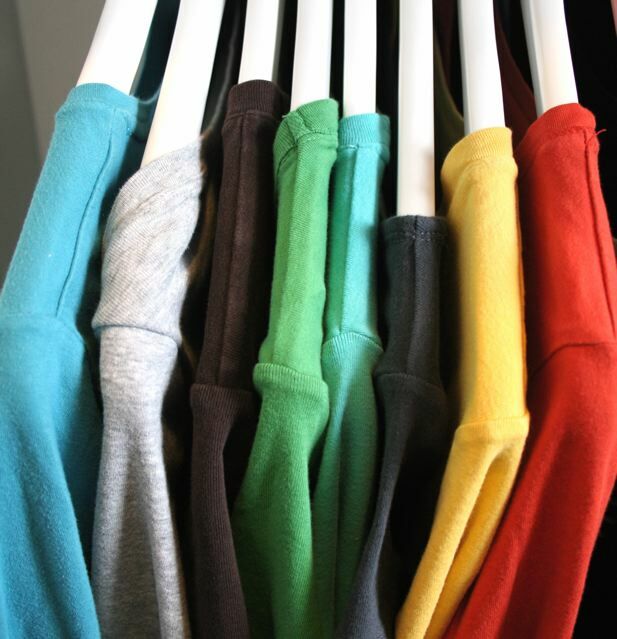 She shares some tips for altering t-shirts for a better fit. We all have them. Shirts we fell in love with but leave hanging in our closet because there is something wrong with the fit. I have a long, sad history with T-shirts in particular. I love a well-fitting T-shirt, but actually finding a nice tailored one that fits me right off the rack is nigh unto impossible because of my wide shoulders and average trunk. If it fits my shoulders, it is too loose in the arm holes and body. If it fits my body, it is too tight in the shoulders. Here is an easy fix for that kind of 'too loose' (now you say Lautrec) fit problem, or for any T-shirt that you would like to make more tailored. 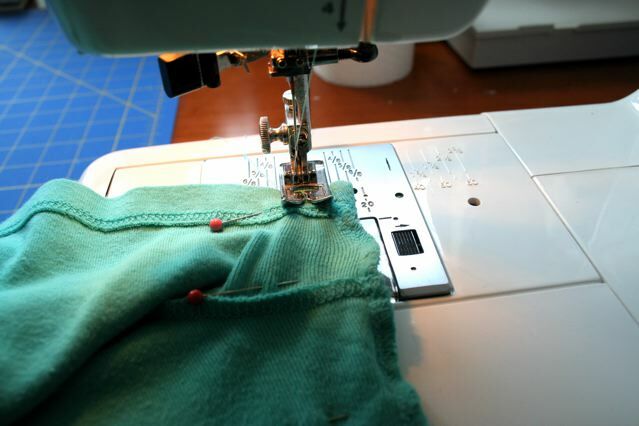 It doesn't require a lot of sewing experience or a serger. Just a regular machine with a *zig zag stitch. I don't even switch my needle to a ball point for this. *Why does it have to be a zig zag and not a straight stitch? Because knits stretch, and so will a zig zag stitch. Straight stitches, not so much. The Problem: T-shirt that is too roomy. The Fix: A simple zig zag seam up both sides and arms. 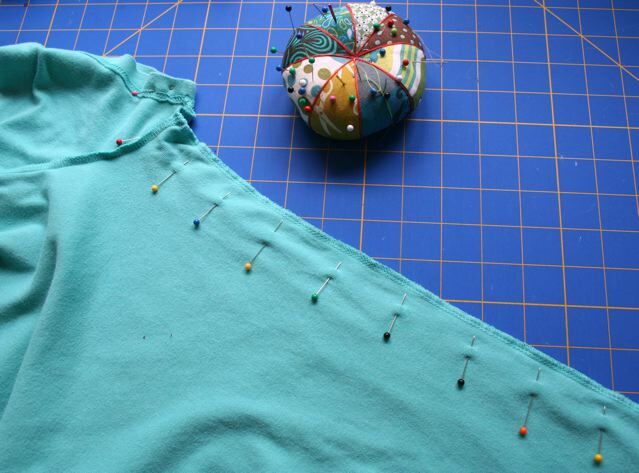 So easy you'll be tailoring all your T-shirts in record time. Try your T-shirt on. 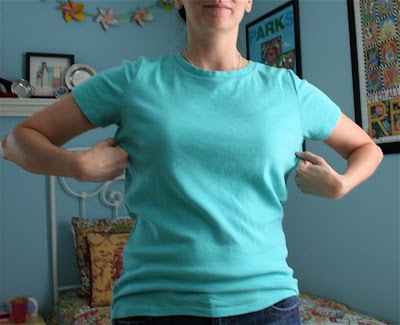 Pinch the excess under your arms with your fingers and determine how much you need to take it in to make it fit better. Knit is forgiving, don't sweat this too much. If it is still too loose or too tight after sewing, just add a new line of stitching and then remove the old one if needed. I usually end up sewing a 1/4 to 1/2 inch seam. 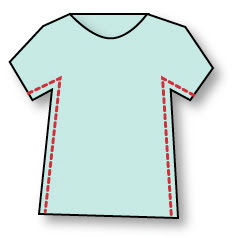 Turn the shirt inside out and lay it flat. Smooth it down with your fingers, but don't stretch it. 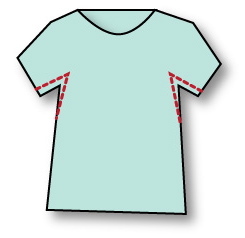 Pin the sleeve and side together at the seam so that the hems are aligned. Using a small zig zag stitch (small stitch length as well as width), start at the arm and sew your way down. Be sure to back stitch at both ends to lock your stitches. Important: don't stretch the fabric or pull it as you are sewing. Let it go through at its own pace. If the fit problem is just in the chest, you can taper off your seam. If the fit problem is in the entire body of the shirt, you can run your seam all the way down the side. Now repeat the same thing on the other side of the T-shirt. I find that most times I do not even need to cut off the old seam. Knit is very forgiving and the new seams lay flat and feel comfortable. 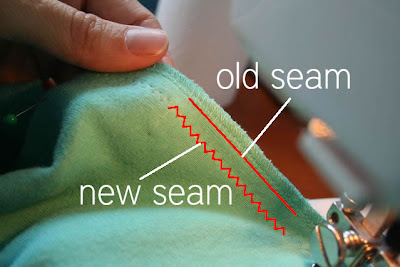 If you do cut off the old seam, be sure to overlock the raw edges to strengthen the new seam. See ? That was easy. Done! Thank you, Larissa. Easy, and flattering fit. Be sure to visit mmmcrafts for a little bit of everything, sewing, paper crafts, and my favorite, softies. Thank you for sharing this. I think we all have T-shirts like this. Thank you so much! I have a question, what do you do if the t-shirt has no seams (the part around the body). I have many men's shirts that don't have seams around the body..the fabric is a tube. any advice you have would be awesome. Sommer, hey, this is Larissa. Just pretend they do have seams. Lay it flat as shown and pin a line from the seam in the sleeve all the way to your shirt hem. Then sew a new seam as shown. Make sense? this is great! one question: what do you mean by "overlock" the raw seams? 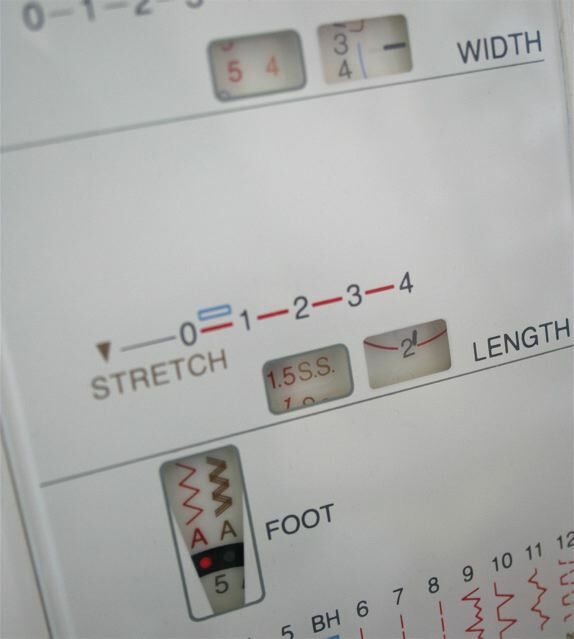 Julie, overlock is a stitch that goes over the edge of your fabric as well as through it. It is designed to keep your fabric from fraying. You can use a zig zag stitch to overlock your raw edges (just let the zig go beyond the edge of your fabric and the zag go through the fabric), or some machines have an actual overlock stitch just for this. I just tried this, and it was AWESOME! Thanks so much for teaching this new sewer how to channel her enthusiasm. And save some cash at the same time!